Presently in stock we have clocks from miniature collectable size in delf porcelain to large floor clocks. There are over 100 different model cuckoo clocks from basic quartz, one and 8 day mechanical to fully animated models. With over 72 different model floor clocks from traditional to contemporary. Traditional wall regulators also make up a large part of the inventory, as do modern designer wall and pendulum clocks. Another range carried by Clocks NZ is the exquisite Reuge music boxes from Switzerland, which are the crème de la crème of music boxes. There is a wide variety of tunes from traditional classics to up to the minute Titanic theme songs. Come and visit our showroom to see the extensive range of clocks and barometers we have to offer. All of the clock making expertise that goes into our floor clocks can also be found in our wall, mantel, and tabletop clocks. If it's a clock your looking for, Clocks NZ has it - we have over 600 models in stock. Please click on the following links to find out more. AMS - modern wall clocks from Germany. Anton Schneider - cuckoo clocks. Comitti of London - clocks and barometers. 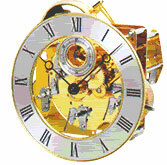 Hermle - traditional grandfather clocks, anniversary clocks, style clocks, wooden regulators, wall clocks. Howard Miller - grandfather clocks, floor clocks, mantel, table, maritime clocks and barometers, commemorative and memorial clocks. Reuge - music boxes from Switzerland. Vilbor - barometers from Germany.